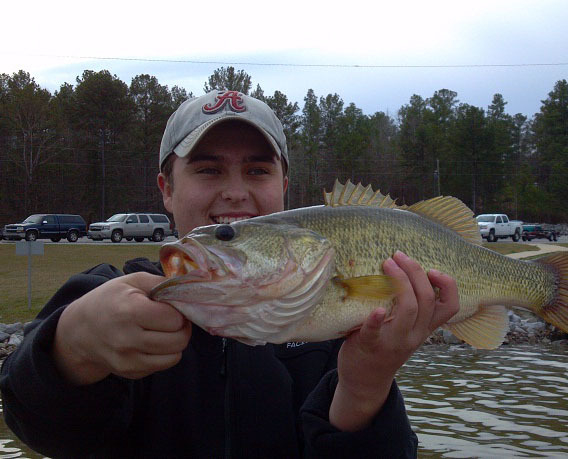 Lake Martin is an excellent lake for fall bass fishing. Anglers that frequent this 39,000 acre reservoir, Impounded in 1926, find the Tallapoosa River spotted bass an exceptional adversary to target as waters begin to cool. Fall is a time for change. 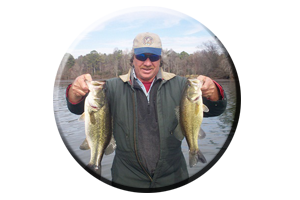 Especially for the Tallapoosa River spotted bass that always seem to be on the move in search of an easy meal or some hapless prey. These feisty little fish roam Lake Martin in huge wolf packs (often numbering over 100 bass) and they really begin to feed and fatten up during this fall season and early winter period. As the water temperature plummets on the main body of water of Lake Martin, the schools of baitfish come to the waters surface. It is warmer in calm backwaters and these out of the current places show a plankton bloom for the baitfish to feed on. These baitfish schools can be minnows, threadfin shad, gizzard shad, bream, sunfish, crappie, catfish, crayfish or even smaller bass. Most of these prey (the bass constantly dine on), can be found out of the main lake current. Baitfish are often found in spots like small, wind blown cuts, pockets, along flats or the around the mouths of major feeder creeks. Schools of bass gather here in the fall to feed and fatten up, often holding in these places for days. The calm side of points and around islands are also excellent places to look for schools of feeding bass this fall season. Schooling bass can be very visible as you see them hitting on top with evident schools of fleeing baitfish activity. Places schooling bass are found in are shielded from late Fall’s slowly creeping in cold fronts and out of the high winds of the fall season. Baitfish are high on the menu of both spotted bass and largemouth bass that inhibit the entire Lake Martin waters. Anglers have many lure choices when it comes to selecting baitfish imitating lures, that can fool even the largest of bass when they are frantically feeding on top. Always try topwater lures, mid running lures and lures fished on or the near the lakes bottom. The crayfish these bass feed on are plentyfull in Lake Martin and each of these bass will consume dozens of crayfish during the fall season. These crustaceans come in all colors and all sizes. They can be found anywhere there are rocks. Crayfish also burrow up in holes in red clay banks. Crayfish can be found scrounging for food along the lakes sandy bottom and even found on muddy bottoms if its all they have to relate to. 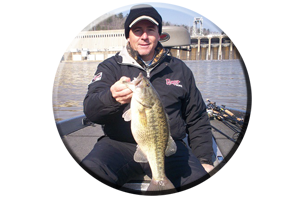 Include your search for these actively feeding bass along rock bluff walls, banks featuring huge scattered boulders, broken rock walls or man made block walls (seawalls). Or Lake Martin’s bass that have a desire to eat crayfish regularly, can be found feeding in other places around the lake featuring banks lined with rocks. Man made rip-rap rocks, such as those rocks seen along the lakes many bridges, culverts, rip-rap lined causeways and all along the dam area hold hundreds of crayfish. Visible rock islands and submerged rock piles or boulders (submerged islands are buoy marked lake wide), can be found with the aid of a good map. Crayfish imitating lures can be plastic crayfish fished along the lakes bottom Texas rigged, a jig and pork trailer or jig combo, tube baits, twin tailed grubs fished on a jig head. Even crayfish colored crankbaits and rattling lipless lures like Rattletraps and Cordell Rattling Spots are good crayfish imitating lures. 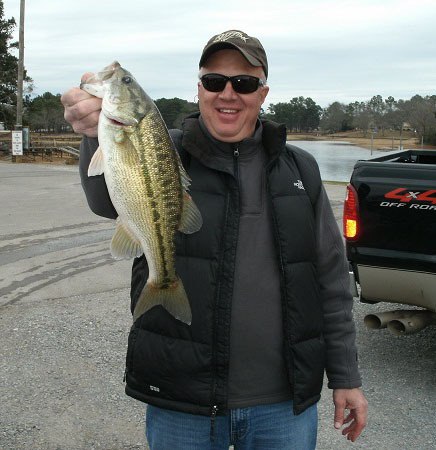 Anglers that begin their search for the seemingly elusive spotted bass of Lake Martin should concentrate their efforts along the calm, shielded areas just off the main lake as waters begin to cool in the fall period. Look for baitfish schools or feeding bass along main lake flats, midways up in major feeder creeks, around islands, or along any points leading into small cuts and pockets. These flats feature scattered brush, stumps and other forms of wood cover and rock cover, for the spotted bass to relate to. Most of this cover is now easily visible with the lake drawn down for winter pool. Flats are warmer during late fall and early winter, especially when bathed in an all day sunshine, which takes place from mid morning to late evenings. Warming trends can occur off and on as the fall season ends and winter slowly sets in. During these brief warming periods, just a few warm days and mild nights can temporarily bring the water temperature up a few degrees. This is the time for anglers to be on the water. As waters warm (after cooling for a few weeks) these Lake Martin Bass become active, inducing them to constantly feed for a few days as they invade the shallows once again attacking hapless prey. That is until conditions change again. These warming trends are usually followed by a few cloudy days (often with rain), before another cold front comes in to temporarily shut the bass down again. 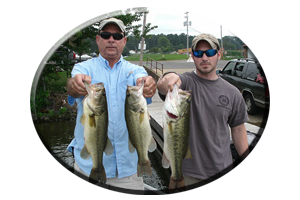 Targeting Lake Martin’s Tallapoosa River spotted bass can mean fishing with lures that mimic the baitfish and crayfish they are feeding on. On most occasions anglers that frequent Lake Martin stick with smaller worms, small lizards, tube baits, jig combos, crayfish imitations, creature baits, jigging spoons, tail spinners, blade baits, small crankbaits, jerkbaits, spinnerbaits and an array of topwater lures. These spotted bass do have a small mouth. But it does not mean they will not hit bigger, more gaudy type lures. 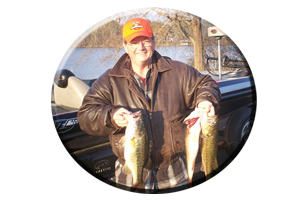 Lures usually reserved for their cousin the largemouth bass, will work. Spotted bass can have a mean attitude, especially when it comes to attacking an aggravating, oversized offering. I have even seen spotted bass hit topwater lures with their mouths closed, then return for the kill, then inhaling the seemingly stunned prey with an evident vengeance. Pound for pound these are very hearty bass and any spotted bass anglers do battle with this winter on Lake Martin…is a very memorable occasion. Looking for some exciting bass and striper fishing this fall and winter season? Whether you frequent Lake Martin regularly and just want to increase your fishing knowledge or your interested in learning how to fish any other Lake in Alabama, remember; Always Call on Reeds Guide Service…first! (205) 663-1504. 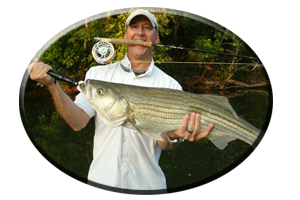 “Over 40 Years Fishing and Guiding on Lake Martin and all other Alabama Lakes for bass and stripers.” A guided fishing trip with Reeds Guide Service also makes a great surprise Birthday gift, Fathers Day gift or Christmas gift (certificates available), for those loved ones that love to fish!